This book examines the management of Procuring Complex Performance (PCP) in large-scale programmes that includes the downstream support phase in sectors such as construction, healthcare, transport, aerospace, marine and defence. It brings together a series of edited chapters to explain why the traditional combination of linear project management and highly detailed contracts are now unsuited to the dynamics of emerging customer requirements based on performance and outcome. Working with leading business professors across the UK and Europe, Caldwell and Howard present the case for why large-scale programmes of world class organizations often represent a shifting frontier between the boundaries of public-private provision and silos of operations expertise. Adopting a procurement perspective, the authors explain how complex performance means not just coping with the dynamics of buyer-supplier relationships, but incorporates the shift from production orientation towards availability of bundled services such as maintenance and upgrade delivered over extended, often multi-decade timeframes. The strength of `PCP' is its empirical case-based support for new business models based on through-life management, availability contracting and service support which challenge simplistic notions of dyadic, hierarchical relationships and transfer of risk to the supply base. 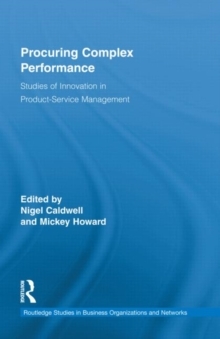 This unique publication is essential reading for scholars and practitioners seeking to understand the context of innovation and supply as a coordinated and integrated approach to managing and procuring complex performance.